Objective Japan's 2011 Fukushima Daiichi Nuclear Power Plant incident required the evacuation of over a million people, creating a large displaced population with potentially increased vulnerability in terms of chronic health conditions. We assessed the long-term impact of evacuation on diabetes, hyperlipidaemia and hypertension. Participants We considered participants in annual public health check-ups from 2008 to 2014, administrated by Minamisoma City and Soma City, located about 10–50 km from the Fukushima nuclear plant. Methods Disease risks, measured in terms of pre-incident and post-incident relative risks, were examined and compared between evacuees and non-evacuees/temporary-evacuees. We also constructed logistic regression models to assess the impact of evacuation on the disease risks adjusted for covariates. Results Data from a total of 6406 individuals aged 40–74 years who participated in the check-ups both at baseline (2008–2010) and in one or more post-incident years were analysed. Regardless of evacuation, significant post-incident increases in risk were observed for diabetes and hyperlipidaemia (relative risk: 1.27–1.60 and 1.12–1.30, respectively, depending on evacuation status and post-incident year). After adjustment for covariates, the increase in hyperlipidaemia was significantly greater among evacuees than among non-evacuees/temporary-evacuees (OR 1.18, 95% CI 1.06 to 1.32, p<0.01). Conclusions The singularity of this study is that evacuation following the Fukushima disaster was found to be associated with a small increase in long-term hyperlipidaemia risk in adults. Our findings help identify discussion points on disaster planning, including preparedness, response and recovery measures, applicable to future disasters requiring mass evacuation. This is the first study to assess the long-term impact of evacuation on diabetes, hyperlipidaemia and hypertension following Japan's 2011 Fukushima nuclear incident. Public health check-up data for 2008–2014 from the most affected areas, 10–50 km from the Fukushima nuclear power plant, were evaluated. Area-level radiation concentrations, a potential confounder for the evacuation effect on chronic health, was taken into account. Health check-ups were provided only to the self-employed and on a voluntary basis, potentially biasing the results and limiting our ability to generalise to the wider population. Despite the likely low risk of radiation-related health consequences, the health effects of the Fukushima incident are not limited to those due to radiation exposure. A major disaster often requires evacuation of a large population, which exerts a powerful influence on individual vulnerability to psychological stress and creates changes in socioeconomic status (eg, employment and income), thus impacting on people's health.18–21 the Fukushima incident is no exception. Soon after the incident, following a series of government evacuation instructions, over 80 000 people from the area surrounding the Fukushima nuclear power plant were forced to relocate within the Fukushima Prefecture, or move out of this Prefecture, with some moving hundreds of kilometres away from the plant; some moved several times.22 Of those who were made to evacuate, more than 70 000 are still subject to a range of evacuation measures as of 5 September 2015, following slight lifts of the instructions.23 Yasumura et al24 and Nomura et al25 reported threefold increase in mortality among evacuated nursing home residents up to 1 year following the incident. Elevated values of metabolic markers, including body mass index (BMI), blood pressure, glucose metabolism, lipid metabolism and liver function, were also demonstrated in evacuees, by Satoh et al26 and Tsubokura et al,27 1 year after the incident, suggesting worsening chronic health conditions. Yabe et al28 showed that, 2 years after the incident, the proportion of adult evacuees who scored above the K6 psychological distress index cut-off point (≥13) for general mental health, was four to five times higher than that of the pre-incident general population in Japan. In Japan, municipal public health centres provide annual free health check-ups for self-employed residents aged 40–74 years. We evaluated the data from these public health check-ups in the most affected areas of the Fukushima Prefecture in the 4 years following the Fukushima nuclear incident. The research objective of the present study was to assess the impact of evacuation on chronic health. We aimed to (1) gain a stronger understanding of the influence of evacuation on long-term health in order to inform the design and delivery of measures to manage health risks after the Fukushima incident and (2) identify discussion points on disaster planning for future disasters requiring evacuation and/or involving displaced populations. The study sites are Minamisoma City, located in 10–40 km from the Fukushima Daiichi Nuclear Power Plant, and Soma City, located to the north of Minamisoma, and 35–50 km from the Nuclear Power Plant, where we have been supporting clinical care and research since the incident. Note that Japan has three levels of government: national, prefectural and municipal. The nation is divided into 47 prefectures. Each prefecture consists of numerous municipalities, and there are three types of municipalities in Japan: cities, towns and villages. On 12 March 2011, a 20 km radius from the nuclear plant was denoted by the central government as a restricted area with compulsory evacuation.30 Minamisoma therefore straddles the initial compulsory evacuation restriction zone (where about 17 000 people had lived, representing 24.7% of the total population of Minamisoma),33 while Soma was entirely outside this zone. 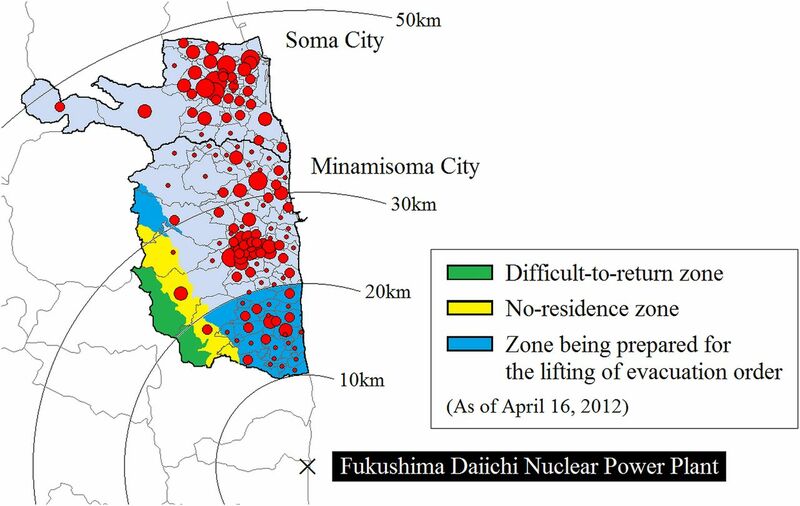 The pre-incident populations (as of February 2011) of Minamisoma and Soma were 71 494 and 38 054, respectively.33 ,34 On 22 April 2011, the compulsory evacuation zone was expanded slightly to the northwest based on the measured dispersion of highly radioactive fallout (figure 1), and on 16 April 2012, this compulsory evacuation zone was reclassified into three zones in line with air dose rates (figure 1): (1) difficult-to-return zone; (2) no-residence zone and (3) zone being prepared for lifting of the evacuation order. With frequent small changes, these evacuation instructions are still in effect today. The geographical scope of these 2012 instructions and the locations of Minamisoma and Soma, relative to the nuclear power plant, are shown in figure 1. Geographical location of Minamisoma City and Soma City. The red circles show the geographical distribution of the health check-up participants in 2010, where the circles are proportional to the number of participants living in each district. The compulsory evacuation zone is divided into the (1) difficult-to-return zone (in green), where the annual dose of radiation is expected to be 50 mSv or more and people are not allowed to return home until at least March 2017; (2) no-residence zone (in yellow), where the annual dose is expected to be 20–50 mSv and people can temporarily return home to the area, but staying overnight is prohibited and (3) zone being prepared for lifting of the evacuation order (in blue), where the annual dose is expected to be <20 mSv and people can temporarily return home to the area, but staying overnight is prohibited. We employed data from public health check-ups, administrated by the Minamisoma and Soma city offices, from 2008 to 2014, and compared post-incident data (2011–2014) with pre-incident ‘baseline’ data (2008–2010). The public health check-up is available only for those aged 40–74 years, and covered by National Health Insurance, which is designed for people who are not eligible for any employment-based health insurance programmes (ie, the self-employed, such as farmers, fishermen, etc), and is performed annually at the designated community centres and medical institutions during June–October. A health check-up notification is sent to each household every year, based on the city's family registry. The check-up information is also disseminated using each city’s public relations magazine. The check-up comprises a physical examination, blood sample test, and self-report medical history and lifestyle survey. The analysed data set included age and gender; clinical characteristics and blood test results from the physical examination; and family disease history, surgical history, treatment history and lifestyle information from the self-report survey. Details are shown in table 1 and online supplementary table S1. In addition, we considered district-level radiation levels (see below section, ‘Air dose rates’). As outcome measures of this study, we considered diabetes, hyperlipidaemia and hypertension. To define each outcome, we used the clinical guidelines for disease diagnosis or self-reported medication use: glycated haemoglobin (HbA1c) of ≥6.5% or use of antihyperglycaemic agents for diabetes; low-density lipoprotein cholesterol (LDL-C) of ≥140 mg/dL or use of antihyperlipidaemic agents for hyperlipidaemia; and systolic blood pressure of ≥140 mm Hg, diastolic blood pressure of ≥90 mm Hg, or use of antihypertensive agents, for hypertension.35–37 We considered only those who participated in the check-ups both at baseline and in one or more target years. Note that not every individual had a check-up every year. For individuals who took the check-ups several times in a year, data from the first check-up in the year were considered. We considered the results of the third MEXT monitoring performed between 31 May and 2 July 2011; fifth monitoring between 22 and 28 June 2012; seventh monitoring between 27 August to 28 September 2013; and ninth between 1 September and 7 November 2014, for the radiation levels of 2011, 2012, 2013 and 2014, respectively.39 The district-level radiation level was then calculated by averaging the values at each monitoring point within a district by year, and this district average value was then assigned to each participant in each year, based on district of residence at baseline. We classified the participants into two subgroups by evacuation status: evacuees and non-evacuees/temporary-evacuees. Based on the pre-incident district-level address, those who were living in the districts denoted compulsory evacuation after the incident (ie, all the evacuation areas highlighted in figure 1) were defined as evacuees. Participants who were living outside the compulsory evacuation zones were defined as non-evacuees/temporary-evacuees (including voluntary temporary evacuees). Note that because evacuees usually do not declare their change of address to the city office after their evacuations, the address recorded in the city resident registers collected from the post-incident health check-ups indicated not the evacuation site, but pre-incident dwelling site. This means that post-incident addresses of the evacuees were not identified. To examine the impact of evacuation on chronic health, we compared clinical characteristics between evacuees and non-evacuees/temporary-evacuees by year. In addition, the pre-incident and post-incident relative risk (RR) of diabetes, hyperlipidaemia and hypertension were calculated with adjustment for age by evacuation status and year, in order to compare change of the disease prevalence after the incident, between evacuees and non-evacuees/temporary-evacuees. Baseline risk was defined as the average disease prevalence from 2008 to 2010. If an individual took a health check-up more than once in these 3 years, their most recent data were used in calculating the baseline. We conducted regression analyses to assess the impact of evacuation, adjusted for covariates. The regression models were constructed separately for diabetes, hyperlipidaemia and hypertension, using post-incident data (2012–2014). Note that because the health check-up of 2011 was performed only months after the incident, many unobserved factors (eg, environmental/socioeconomic factors) that potentially influence disease risk might exist in 2011 data, and/or variables included in the regression models might have different functions in 2011 than in other years. Hence, to prevent possible bias on regression coefficients, we excluded 2011 from the analysis. Since every participant had more than two check-ups during the study periods, the regression models included a random effect at individual level to control for the fact that the same individual’s data were correlated. We compared disease risk in evacuees versus non-evacuees/temporary-evacuees, using logistic regression. The radiation level at the residential areas may be a significant factor confounding the evacuation effect because it may have strong relationship with psychological stress/anxiety, known to be associated with chronic health conditions.40 ,41 However, because the post-incident addresses of the evacuees were not identified, it was impossible to adjust for post-evacuation radiation level. Therefore, to better understand the effect of radiation levels on disease risk, we modelled the associations between the disease risks and radiation levels in non-evacuees/temporary-evacuees. Note that in this analysis, we included district as a random effect to take into account geographical similarities/differences in the response values for the regressions. Variables initially entered into the regression models were chosen based on the univariate analyses. Additional model selection was performed using backward-stepwise method with p-to-remove of >0.05.42 Backward-stepwise regression starts with all the candidate variables in the model and removes the least significant variables until all the remaining variables are statistically significant. The partial F-test was used to verify for the entry and removal of variables from the model. Variables that were known or suspected risk factors (eg, family history) were incorporated into the final model regardless of their statistical significance. Geospatial processing of data was conducted using ArcGIS V.10.2 and all statistical analyses were performed using STATA/MP V.13. A total of 11 279 individuals participated in the check-ups between 2011 and 2014. After excluding those who did not take a check-up before the incident (n=4873), we were left with 6406 individuals with pre-incident and post-incident data. There was a significant difference in gender distribution between included and excluded individuals (59.3% vs 55.6% female, p<0.001). The included individuals were more likely to have hypertension in 2011, 2012 and 2013, than excluded individuals (52.5% vs 46.1% in 2011, p<0.01; 52.2% vs 46.8% in 2012, p<0.001; 52.0% vs 49.0% in 2013, p<0.05), while post-incident prevalence of diabetes and hyperlipidaemia did not differ between excluded and included individuals. Demographic and clinical characteristics are shown in table 1 by evacuation status. Variables did not differ between evacuees and non-evacuees/temporary-evacuees at baseline, nor did they differ in 2011. However, in 2012 to 2014, BMI and high-density lipoprotein cholesterol (HDL-C) were significantly higher and lower, respectively, in evacuees than in non-evacuees/temporary-evacuees. Differences in self-report medical history and lifestyle survey by evacuation status are shown in online supplementary table S1. Although there were no significant differences between evacuees and non-evacuees/temporary-evacuees in treatment history at baseline and in 2011, a significant difference was identified in treatment for hyperlipidaemia after 2012, with evacuees significantly more likely to receive outpatient treatment than were non-evacuees/temporary-evacuees. In addition, differences in lifestyles between evacuees and non-evacuees/temporary-evacuees were noted. From 2011, evacuees were significantly more likely to have gained or lost more than 3 kg of their weight over the previous year. From 2012, evacuees were also less likely to feel refreshed after a night’s sleep. In addition, the non-evacuees/temporary-evacuees tended to walk faster than evacuees, both after 2011 and in the baseline year, possibly indicating that the higher BMI after 2012 in evacuees could be somewhat confounded by this walk speed difference. Table 2 shows the age-adjusted pre-incident and post-incident RR of each outcome. For diabetes, evacuees and non-evacuees/temporary-evacuees both had significantly higher risk in 2013 and 2014 than at baseline. These RRs did not significantly differ between evacuees and non-evacuees/temporary-evacuees in any year. For hyperlipidaemia, in evacuees, risk was significantly higher in 2012, 2013 and 2014, compared to at baseline. In non-evacuees/temporary-evacuees, risks were significantly higher in 2013 and 2014. The RR of hyperlipidaemia by evacuation status was significantly different in 2012 (p<0.05) and in 2013 (p<0.01), showing the increased risk in hyperlipidaemia was significantly greater among evacuees than among non-evacuees/temporary-evacuees. For hypertension, the RR was borderline significant in 2013 for evacuees, and significantly reduced in 2014 for non-evacuees/temporary-evacuees. The difference of the RR of hypertension between evacuees and non-evacuees/temporary-evacuees was not significant in any year. The estimated impact of evacuation on disease risk is shown in table 3. For diabetes, there was no significant difference in risk between evacuees and non-evacuees/temporary-evacuees post-incident after adjustment for covariates. We identified a small but significant effect of evacuation on hyperlipidaemia risk (OR 1.18, 95% CI 1.06 to 1.32, p<0.01). This result is consistent with that shown in table 2, suggesting that the evacuation effect on hyperlipidaemia risk was not entirely accounted for by potentially confounding covariates. In other words, the evacuation effect persisted after adjustment for potential confounders. 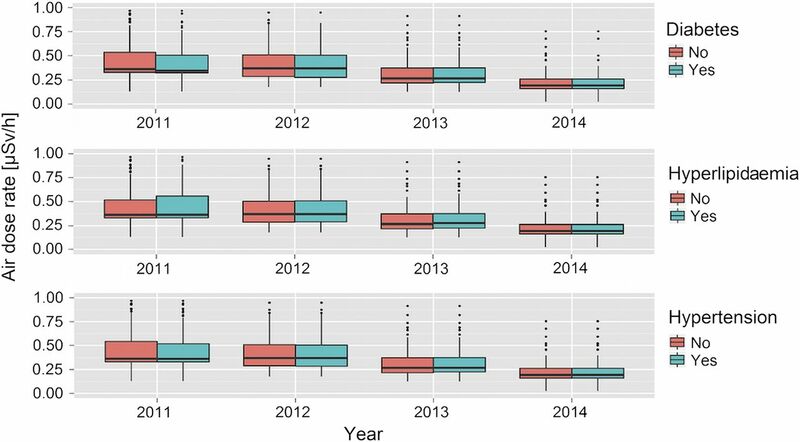 An interaction term of ‘evacuation’ and ‘year’ variables was examined in the regression model to test for the different evacuation impacts by year, but no interaction was observed (data not shown), suggesting that effect of evacuation was similar in 2012, 2013 and 2014. For hypertension and diabetes, no significant difference in risk between evacuees and non-evacuees/temporary-evacuees was identified. In addition to evacuation, we identified several other covariates associated with disease risk (table 3). For example, the older age group (65–74 years) was significantly more likely to experience an increase in disease risks post-incident than the younger age group (40–64 years). Females had twice the risk of hyperlipidaemia as males, while the post-incident risks of diabetes and hypertension were higher in males than in females by about 2 and 1.5 times, respectively. As many previous studies have acknowledged,43–45 family history of disease was significantly highly associated with disease risk for each outcome. Tobacco use and alcohol consumption were also found to be associated with disease risks, although not always in the expected direction, making these results difficult to interpret. Interestingly, hypertension was significantly associated with eating speed; those with slow eating speed were less likely to have hypertension (OR 0.72, 95% CI 0.63 to 0.84, p<0.001). Figure 2 shows the distribution of district-level radiation concentrations for non-evacuees/temporary-evacuees by disease status. After adjustment for covariates, among non-evacuees/temporary-evacuees, no significant associations between diseases risk and radiation levels were observed post-incident for any of the outcomes (data not shown). We conducted sensitivity analyses by constructing models using radiation levels in a categorical form (quantiles), rather than as a continuous variable, and results were similar. These results indicate that level of radiation exposure did not affect disease risk for these chronic diseases. Note that, according to WHO’s dose estimation, the annual effective doses in the first year following the incident were 3–5 mSv in the general population of the Fukushima Prefecture, excluding most affected areas (ie, Namie Town and Iitate Village, 30 km northwest of the plant). These doses are too low to increase the radiation-induced health risks, as mentioned earlier.16 Associations of other covariates with the disease risks in this subset of the population were similar to those estimated using the whole study population (data not shown). Box plots for the distribution of radiation levels at non-evacuees’/temporary-evacuees’ residences by disease status. The bar represents the median radiation air dose rate, the box shows the 25th and 75th centiles, whiskers are 1.5 times the IQR, and outliers and extreme outlets are shown by dots and asterisks, respectively. Adequate control of diabetes, hyperlipidaemia and hypertension is vital to reduce the risk of developing serious complications, such as heart disease, stroke and kidney failure. In the aftermath of a disaster, and following evacuation, control of these chronic conditions is very challenging as a result of decreased access to medical care due to change of personal doctor or regular clinic/hospital, reduced physical exercise and dietary change at evacuation sites.46 ,47 Change in socioeconomic circumstances, such as in income and/or employment, and chronic stress, are also known to have a negative impact on control of chronic health conditions.48 In addition, the Fukushima incident posed specific radiation disaster-specific issues. Anxiety about radiation exposure caused a great deal of stress and reduced outdoor activity levels, resulting in reduced physical exercise and reluctance to access medical care.49 Avoidance of particular foodstuffs prone to radioactive contamination also led to dietary changes.12 For these reasons, in the case of the Fukushima incident, post-incident evacuation and radiation levels might be major underlying factors that affect chronic health control. In this study we found that, in the 4-year follow-up of individuals in Fukushima Prefecture, there have been significant increases of prevalence of diabetes and hyperlipidaemia both in evacuees and in non-evacuees/temporary-evacuees, in comparison with baseline years (RR of 1.27–1.60 for diabetes and 1.12–1.30 for hyperlipidaemia). Evacuees had a small but significantly higher risk of hyperlipidaemia than non-evacuees/temporary-evacuees. Despite high levels of public concern, radiation levels were not associated with these disease risks. Although many previous studies reported postdisaster increases in hypertension prevalence, adequate control of hypertension should be achievable after a disaster, as day-to-day self-blood pressure monitoring is possible using a home blood pressure monitor.50 In contrast, diabetes and hyperlipidaemia are more difficult to control after a disaster; almost all available blood glucose and cholesterol monitoring require invasive procedures, self-monitoring is less accepted by patients, resulting in reduced patient compliance in diabetes and hyperlipidaemia monitoring and treatment.51 Previous studies have reported associations between experiences of life-threatening disaster and reduced chronic health control.41 The findings of our study show that, regardless of evacuation, there was significantly increased risk of diabetes and hyperlipidaemia more than 3 years after the incident. This persistent impact on chronic health indicates the necessity of paying particular attention to the mid-term to long-term effects of a disaster on diabetes and hyperlipidaemia. The fact that evacuees had higher risk of hyperlipidaemia but no significant difference in diabetes risk than no-evacuees/temporary-evacuees post-incident may reflect public and clinicians' substantial concern about diabetes. This heightened concern over diabetes, even in the post-evacuation environment (characterised by reduced physical exercise, dietary change and reduced access to medical care as well as socioeconomic changes), may have resulted in diabetes risk in evacuees being successfully managed at a similar level as in non-evacuees/temporary-evacuees. This was not the case for hyperlipidaemia, and these findings suggest that all parties involved in local healthcare should pay more attention to hyperlipidaemia control, with a particular focus on evacuees. Here, our intention is not to over-emphasise the health risks from evacuation, but to highlight that there is scope for reducing evacuation-related health impacts by strengthening local health system disaster resilience. For instance, promoting disease-specific and target-specific measures at community or population level, and/or healthy lifestyle activities at individual level (eg, weight control, sleep behaviour and balanced diet), which we identified as differing between evacuees and non-evacuees/temporary-evacuees post-incident (see online supplementary table S1). This study has several limitations. First, because the definition of ‘evacuees’ in this study was those who were living in the districts denoted compulsory evacuation zones, the ‘evacuees’ did not include voluntary temporary evacuees who were living outside the evacuation zones. Although, in Minamisoma, the proportion of people who were forced to evacuate was about 27% of the total population,33 according to the city office, the population declined to about 10% right after the incident, indicating that approximately 60% of people might have voluntarily evacuated. However, because they were temporary evacuations and the population has rebounded to more than 70% of the pre-incident level so far,53 we assumed that many of the voluntary evacuees returned soon or months/years after the evacuations, though we lack reliable data to evaluate this. Therefore, we are differentiating the effect of mandatory evacuation from non-evacuees/temporary-evacuation. Second, the health check-ups were undertaken on a voluntary basis, and only offered to the self-employed, potentially biasing the results and limiting our ability to generalise to the wider population. Third, the study population comprised only those self-employed and aged 40–74 years, and did not consider the late-stage elderly over 75 years. Also, those who evacuated so far from Minamisoma and Soma or adjacent areas that they were not able to take the cities’ health check-ups were not included in the study. Satoh et al26 reported that evacuees had about 1.4 times higher diabetes risk than non-evacuees/temporary-evacuees 1 year after the Fukushima incident, after adjustment for covariates. This finding was contrary to the result of our study, which suggested no significant difference in diabetes risk between evacuees and non-evacuees/temporary-evacuees post-incident. However, it must be noted that the study population the report by Satoh et al26 included people aged more than 75 years, and up to 90 years (although the authors adjusted for age in their analyses), and some who experienced long-distance evacuations beyond Fukushima Prefecture. Given this, we should bear in mind that evacuation may engender differential vulnerability for elderly people in terms of chronic health conditions, depending on the distance of evacuation. Fourth, it should be noted that evacuation sites include several housing styles, such as shelters, temporary housing, neighbours’/relatives’ house, or new houses. As of July 2015, according to the official website of Minamisoma City, among the evacuees, 30% were staying at neighbours’/relatives’ houses, 34% were living in temporary housing and the remaining 36% had obtained their own new houses.53 However, we were not able to consider these differences in evacuation experience in our analysis. Because different housing situations may create social stratification, which, in turn, engender differential exposure to post-evacuation health-compromising conditions, further investigation is necessary to clarify those housing styles that are more relevant to chronic health issues. Finally, our study sites suffered not only from the Fukushima nuclear incident, but also the tsunami that ravaged the seacoast areas of the cities right before the incident. Although the dataset of Soma did not include the data of tsunami victims, that of Minamisoma contained tsunami victims’ data because of the different data set management/processing by the city offices. Since it was impossible to identify the tsunami victims of Minamisoma in the data set collected, our study was not able to adjust for the health impacts of the tsunami. However, given that the percentage of the tsunami victims in the total population of Minamisoma was only 1% (n=790, including missing persons),54 the statistical influence of this limitation on the analysis results is likely to be very small or marginal. The singularity of this study is that the evacuation following the Fukushima incident was found to be statistically significantly associated with a small increased risk of hyperlipidaemia in the long term (ie, years) among people aged 40–74 years. No evacuation effect on diabetes or hypertension was observed, however, diabetes risk was increased in the whole study population (evacuees and non-evacuees) 2–3 years post-incident. Our findings could be used to guide actions taken before and during disaster events where mass evacuation takes place in order to manage the postdisaster evacuation-related health risks. The authors express their gratitude to the Minamisoma and Soma city employees and Minamisoma Municipal General Hospital staff for data collection and management. Without their involvement, our study could not have reached its present form.
. Health of Medicare Advantage plan enrollees at 1 year after Hurricane Katrina. Am J Manag Care 2009;15:13–22. Nuclear Regulation Authority. Conceptual diagram of evacuation-directed zones and the number of population and households of each region (as of the end of December 2013). 2013. http://www.meti.go.jp/earthquake/nuclear/pdf/131231a.pdf (accessed 5 Nov 2015). Nuclear Regulation Authority. Conceptual diagram of evacuation-directed zones and the number of population and households of each region (as of 5 September 2015). 2015. http://www.meti.go.jp/earthquake/nuclear/kinkyu/hinanshiji/2015/pdf/0905_02gainenzu.pdf (accessed 6 Nov 2015). Cabinet Office of United Kingdom. Evacuation and shelter guidance: non-statutory guidance to complement emergency preparedness and emergency response and recovery. Cabinet Office (Management & Personnel Office), 2014. The National Diet of Japan Fukushima Nuclear Accident Independent Investigation Commission. Overview of the damage and how it spread. The official report of the Fukushima nuclear accident independent investigation commission. Tokyo: NAIIC, 2012:29.
. Applied longitudinal data analysis for epidemiology: a practical guide. Cambridge University Press, 2013.
. Epidemiological studies: a practical guide. Cambridge University Press, 2002. Minamisoma City Office. Population based on basic resident register of Minamisoma City. http://www.city.minamisoma.lg.jp/index.cfm/8,4705,44,html (accessed 20 Sep 2015). Soma City Office. Population based on basic resident register of Soma City. http://www.city.soma.fukushima.jp/data/new/jinkou/j_jinkou_setai.html (accessed 20 Sep 2015). Japan Atherosclerosis Society. Guidelines for diagnosis and prevention of atherosclerotic cardiovascular diseases. Tokyo, 2007. World Health Organization. Use of glycated haemoglobin (HbA1C) in the diagnosis of diabetes mellitus: abbreviated report of a WHO consultation. Geneva, 2011. Ministry of Education, Culture, Sports, Science and Technology. Results of airborne monitoring survey. http://radioactivity.nsr.go.jp/ja/list/362/list-1.html (accessed 22 Jun 2015).
. A conceptual framework for action on the social determinants of health. Social Determinants of Health Discussion Paper 2 (Policy and Practice). Geneva: World Health Organization, 2010. Minamisoma City Office. Evacuation and living situation. https://http://www.city.minamisoma.lg.jp/index.cfm/10,853,58,html (accessed 20 Sep 2015).
. Reconstruction from the great east Japan earthquak and nuclear accident. Tokyo: Gihodo shuppn, 2012. Contributors All the authors conceived and designed the study, and take responsibility for the integrity of the data and the accuracy of the data analysis. SN, MT and AO acquired the data. SN, MB, MT, AO, TM and SH analysed and interpreted the data. SN, MB and SH conducted statistical analysis and drafted the article. All the authors made critical revision of the manuscript for important intellectual content and gave final approval for the manuscript. Funding This study was supported by a scholarship from Japan Student Services Organization. Ethics approval Ethical approval for the study was granted by the ethics committee of the Institute of Medical Science, University of Tokyo, Japan, authorisation number 25-40-1011.